A furor is building over Boston Review’s decision to keep Junot Díaz on staff. Late on Tuesday, all three poetry editors at the magazine announced they were stepping down starting July 1. 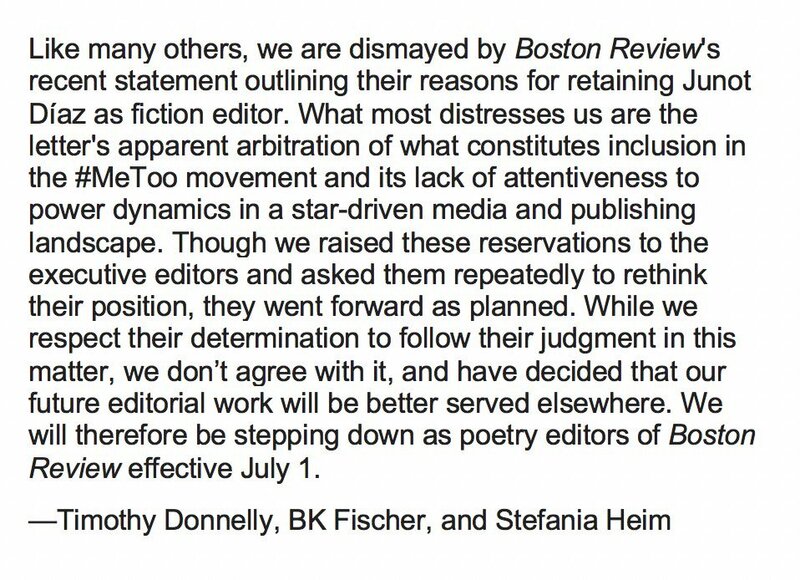 Their decision was in response to a note from Editors-in-Chief Deborah Chasman and Joshua Cohen in which they confirmed that they would be keeping Díaz as the fiction editor despite multiple accusations of sexual misconduct and verbal abuse made against the author. On Thursday, the statement also drew a strong response from the non-profit feminist organization VIDA, known best for its work tracking the gender disparity in major literary publications and book reviews.